The current Under Secretary is Sigal Mandelker, appointed by President Donald Trump, and confirmed to the position by the Senate on June 21, 2017. The Under Secretary heads the Office of Terrorism and Financial Intelligence (TFI), created under 31 USC 312, when the administration of President Bush announced on May 8, 2004, that the Executive Office of Terrorist Financing and Financial Crimes (TFFC), the Financial Crimes Enforcement Network (FinCEN), the Office of Foreign Assets Control (OFAC), and allocated resources from the Treasury Department would be brought under the new office's control. The Under Secretary for Terrorism and Financial Intelligence also possesses oversight of the Office of Intelligence and Analysis, created under 31 USC 311, [one of sixteen agencies in the United States Intelligence Community per 50 USC 3003]. The Federal Reserve remains outside the jurisdiction of this office, and cannot be investigated by it.. The position's predecessor, the Under Secretary for Enforcement, managed law enforcement aspects of the Department prior to the reorganization. The Under Secretary for Enforcement provided oversight and policy guidance for the Bureau of Alcohol, Tobacco and Firearms, the U.S. Customs Service, the Federal Law Enforcement Training Center; the Financial Crimes Enforcement Network, the U.S. Secret Service, the Executive Office for Asset Forfeiture, and the Office of Foreign Assets Control. The Under Secretary also provided policy guidance over the Internal Revenue Service's Crime Investigation. Several of these agencies are now non-existent or have been moved into other federal departments. The Bureau of Alcohol, Tobacco, and Firearms was split into two separate bureaus, with one handling certain law enforcement aspects and the other handling tax collection aspects. The former was moved into the United States Department of Justice, while the latter was kept within the Department of the Treasury. The U.S. Secret Service and the Federal Law Enforcement Training Center are now within the Department of Homeland Security. The U.S. Customs Service was moved into the Department of Homeland Security when it became part of the U.S. Customs and Border Protection. However, under the Homeland Security Act of 2002 Custom Service's "revenue functions" were retained by Treasury. This includes, among others, Customs duties, enforcing trade agreements, and counterfeit trademark detection and seizure. Former Under Secretaries include Jimmy Gurule, James Johnson, Raymond Kelly, Ronald Noble, Stuart A. Levey, and David Cohen. Adam Szubin was appointed Under Secretary under the Obama administration but was never confirmed by the Senate. ^ "Bush Administration Announces Creation of New Office in Ramped up Effort to Fight the Financial War on Terror". Retrieved September 21, 2007. 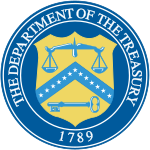 ^ a b "U.S. Treasury - Biography of Jimmy Gurule, Under Secretary for Enforcement". Archived from the original on October 3, 2007. Retrieved September 21, 2007. ^ "U.S. Treasury - Duties & Functions of the Under Secretary of Enforcement". Archived from the original on February 13, 2006. Retrieved February 13, 2006. ^ "About TTB:Home". Archived from the original on June 18, 2006. Retrieved June 18, 2006. ^ "United States Secret Service: History". Archived from the original on October 4, 2007. Retrieved September 21, 2007. ^ "Welcome to FLETC — Federal Law Enforcement Training Center". Retrieved September 21, 2007. ^ "CBP.gov - home page". Retrieved September 21, 2007. ^  6 U.S.C. § 215. ^ "Nominations Sent to the Senate". Retrieved September 21, 2007. ^ "12 in Ariz. militia unit arrested Paramilitary members accused of plotting to destroy federal offices". The Sun. July 2, 1996. Retrieved May 15, 2014. ^ "Secretary General". Archived from the original on September 24, 2001. Retrieved September 21, 2007. This page was last edited on 26 December 2018, at 13:32 (UTC).